Hilton Worldwide has opened its first Doubletree hotel in Coventry. 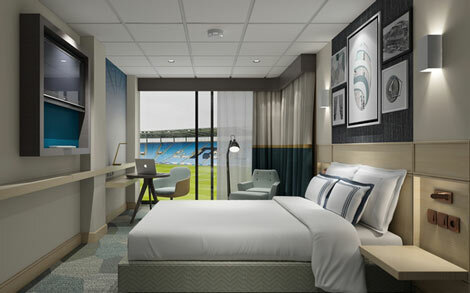 Doubletree at the Ricoh Arena is located in the stadium complex, which is home to the Wasps rugby club and to Coventry City football club. The arena is adjacent to Coventry Arena railway station and is is 20 minutes from Birmingham International airport. The hotel contains 121 rooms, including 50 queen rooms that offer a full view of the pitch itself, thus allowing guests to see the match from their rooms. Eighteen rooms are deluxe while two king suites are also available. Free wifi is available to HHonors members; wifi packages starting at £5 are available for other guests. The Ricoh Arena complex features 80 meeting rooms, accommodating between seven to 7,000 delegates, as well as a 6,000 sqm conference and exhibition hall. The hotel has two dining options, Faradays and Singers Bar & Bistro, with both offer early morning breakfast and evening dinner. A fitness centre is also available. Last month, Hilton opened its first Doubletree in Liverpool (see news, October 14).